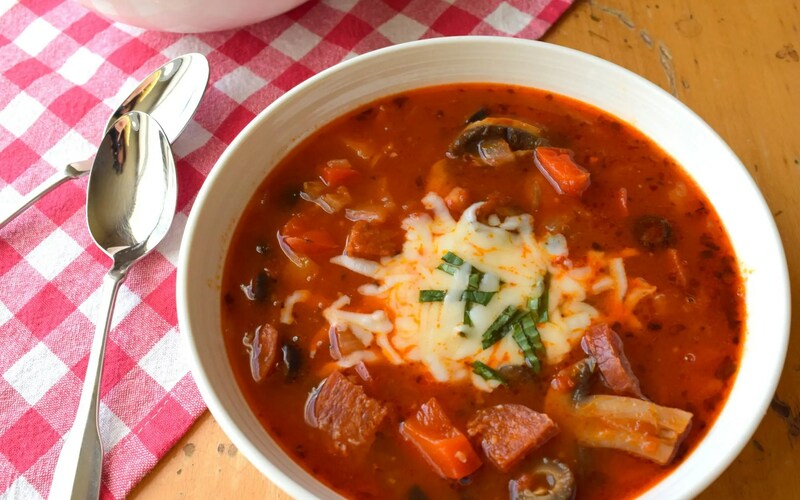 The idea of Pizza Soup doesn’t seem so far fetched when you look at the individual ingredients of a deluxe pizza; they’re all good soup fixin’s! Pizza Soup has quickly become a favorite with my family. The best part is it’s quick and easy to make and there’s nothing like the aroma of a simmering soup to make a house feel warm and cozy! I also love a meal that can be cooked in one pot, it keeps things easy on the cook, as well as the clean up crew. Heat oil in a large soup pot, over medium heat. 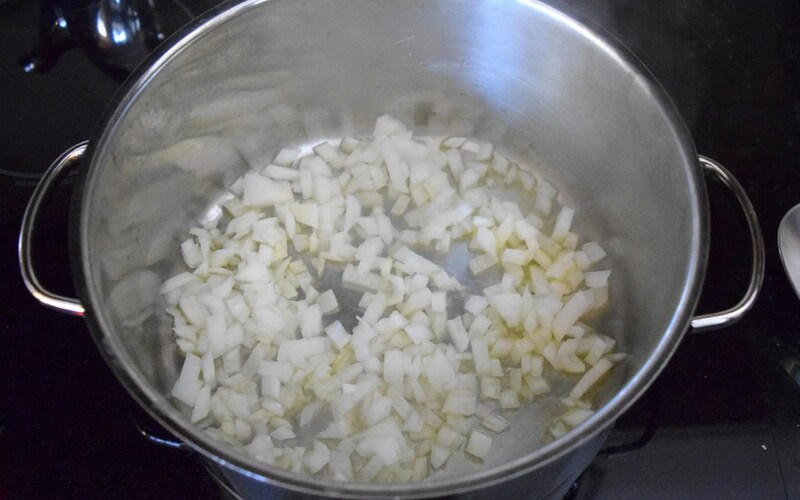 Add onions and cook for 1-2 minutes until the onions are fragrant and just starting to cook. Next add in the peppers and garlic and cook for 2-3 minutes until veggies are starting to soften. It’s important not to let the garlic brown or it will get bitter. 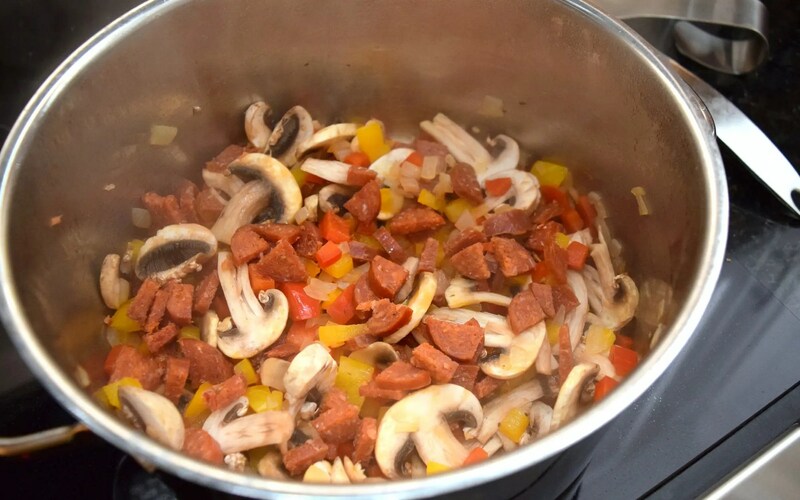 Add in the mushrooms and pepperoni and cook for another 2-3 minutes until mushrooms are soft. Now it’s time for the crushed tomatoes and the chicken stock. I often buy the low sodium version of chicken stock so I can control the amount of sodium. Even with low sodium stock I didn’t need to add any extra salt, the salt in the tomatoes was enough to suit my taste. 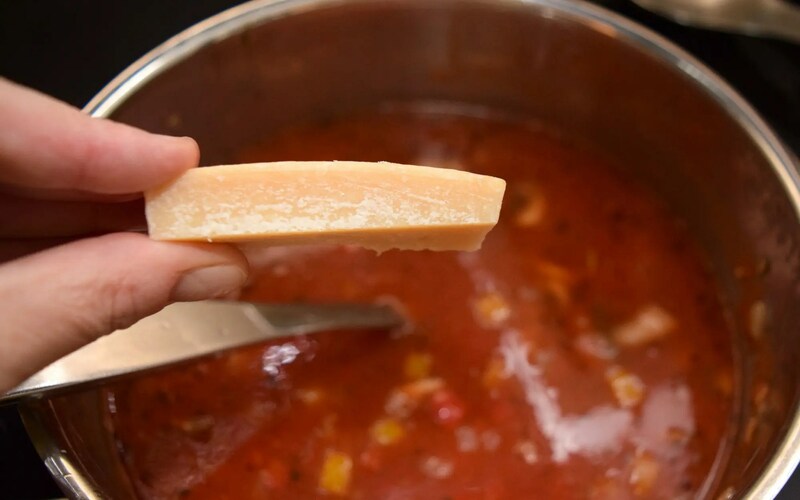 If you have a rind left over from Parmesan cheese be sure to put it in the soup! That rind is nothing but flavor. It works well if you are making spaghetti sauce too! Now simmer for 10-30 minutes, adding the olives when there is about 5 minutes of cooking time left, and it’s ready to serve. Finish that pizza experience with a bit of shredded mozzarella cheese and some thinly sliced basil. Now there’s nothing left but the eating! 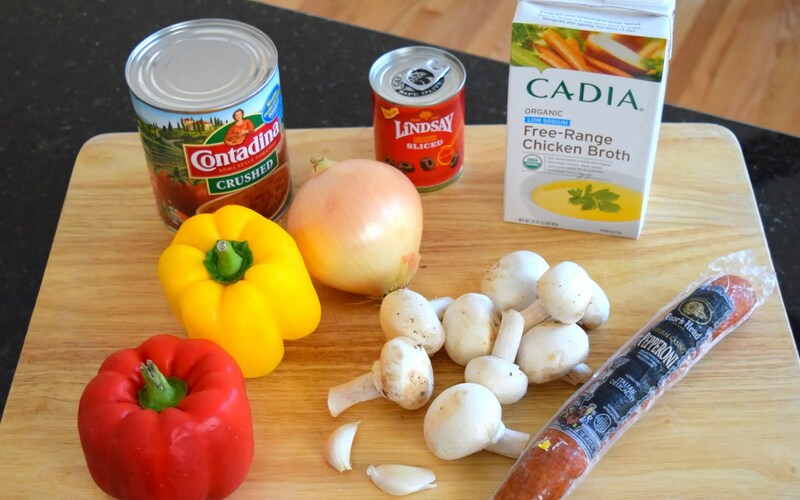 A hearty quick and easy soup, with all the flavors of your favorite deluxe pizza. 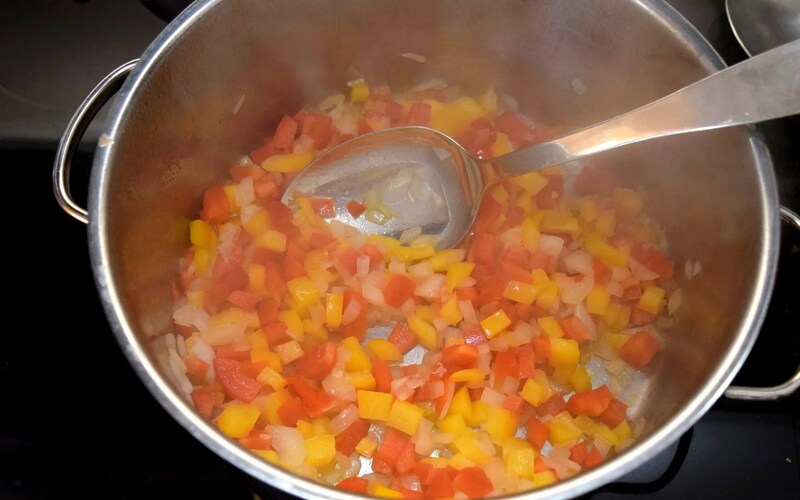 Heat oil over medium heat in a large soup pot and add onion, garlic, red and yellow pepper and cook for 3-4 minutes or until onions are translucent and veggies are beginning to soften. Add in pepperoni and mushrooms and cook for another 2-3 minutes until mushrooms are soft. Add in tomatoes, chicken stock, Parmesan rind, and dried oregano. Season with pepper. 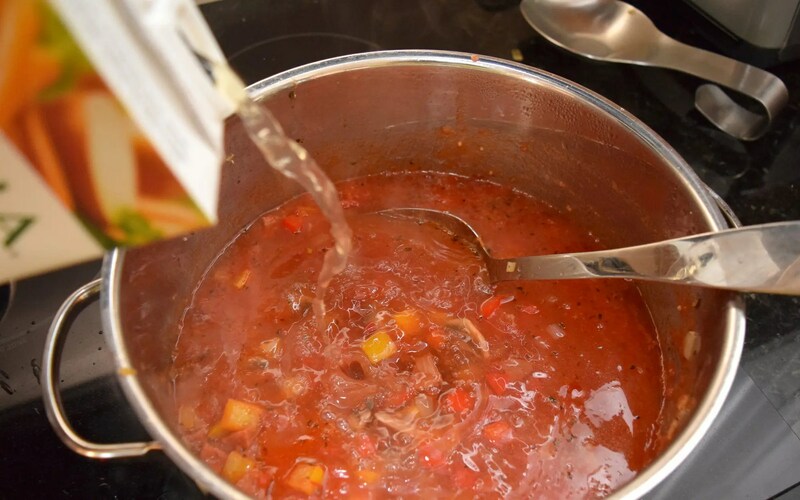 Before you add in any salt be sure to taste as the tomatoes and chicken stock can be salty enough on their own. Let simmer for 10 - 30 minutes. Five minutes before you're ready to serve it, add in the olives. Ladle soup into bowls and top with basil and shredded mozzarella to serve! I saw this on Facebook and had to try it. My whole family loved it but I left out the olives and added parm cheese as well. Thank you! So glad you enjoyed it. I think the best recipes are ones you can make your own! This recipe looks easy enough and something my family would love. Loving all the new ideas here.